My favorite vacation destination is Hawaii, but between the cost of flights and lodging and trying to find the time to go for at least most of a week to make the 5 hour flight worthwhile, I don't get to visit as often as I would like. I have been fortunate to have visited the islands a few times with relatively affordable flights with being on the west coast, but some days, I just need a mental break away. I want to at least pretend I am hiking amongst the lush greenery or listening to the wave crashing on the beach! While I may not be able to physically transport myself in an instant, my sense of smell has made it easy to at take my mind back to my happy place! 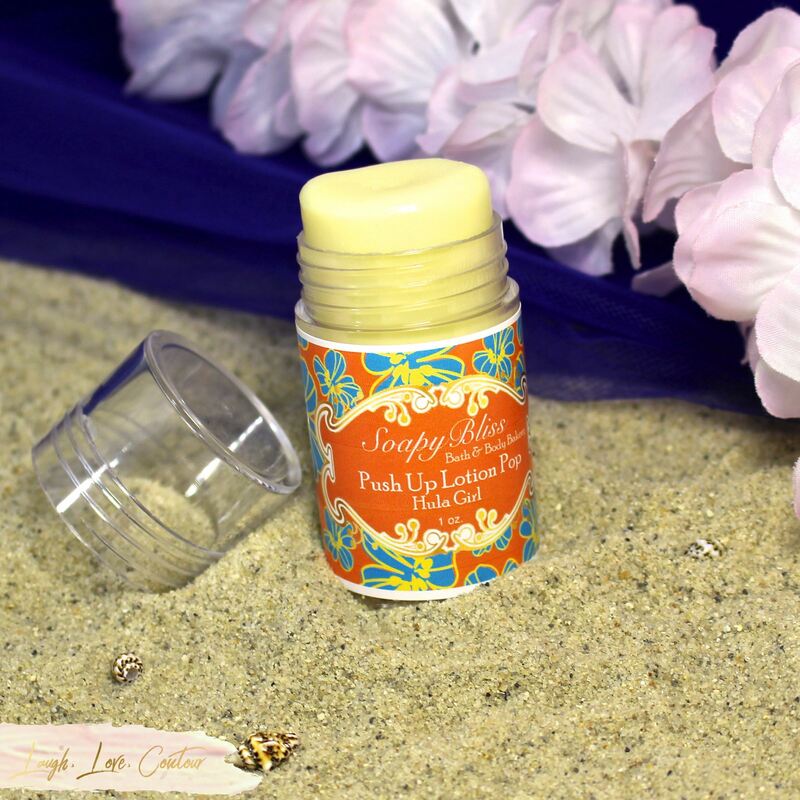 No matter where I go, I can count on the SoapyBliss Push Up Lotion Pop in the scent Hula Girl to immediately transport my mind to Hawaii! With notes of island guava, tangy pineapple, and sweet aroma of plumeria, this scent will take you to tropical paradise in no time! The Hula Girl scent is the ultimate combination of both the tropical fruits that I love with the popular floral found in leis. This fragrance is certainly my heaven in a container! Have I shared my love for this particular scent enough? Let's get to the product details itself since there are other fragrances available for those of you that may have a different preferred type of scent. The Push Up Lotion Pop is exactly as the name implies: it is a solid lotion that is pushed up from the bottom and can be applied to the skin. The packaging is small and easily fits in my hand, but this sweet little pop packs quite a punch! Each Push Up Lotion Pop is loaded with shea butter, cocoa butter, and vitamin E to give your skin the ultimate dose of moisturization. The size makes it ultra portable, so you can toss it in your gym bag for easy application after your post-workout shower or in your luggage to take to any destination of your choosing. As a Carry-On Connoisseur, I appreciate the small size and the solid aspect: not only do I not have to worry about potential leaking caused by pressure changes, I don't have to worry about this lotion taking up the precious space in my quart-sized liquids bag! To apply the Push Up Lotion Pop, simply push up from the bottom so the product is above the edge and rub on the skin. With all the nourishing oils, I have found that a little goes a long way. I like to rub a few stripes on my skin and rub it into my skin. You will want to take care to not go too heavy handed so you don't get oily residue on your clothing, or at least sit around a little longer in the buff and rub a little longer until absorption. I have really enjoyed trying out the SoapyBliss Push Up Lotion Pop! Not only is the product portable and nourishing, I love the colourful packaging! The Hula Girl scent is delightful, but if that isn't quite your jam, they offer 7 additional scent options that might suit your fancy. I have had the opportunity to smell all the offerings, and they all smell so good! My Push Up Lotion Pop is almost empty, and I am so torn between picking up a new scent or another Hula Girl. If that's the only problem I have, then I must being doing well! Ha! Each Push Up Lotion Pop retails for $12 and is available in 1 oz packaging. Please visit the SoapyBliss website here to purchase the different scent options. While there, be sure to check out the other SoapyBliss offerings; they have several cute products, and it is never too early to start thinking about stocking stuffers and holiday gifts for your best girl friends! 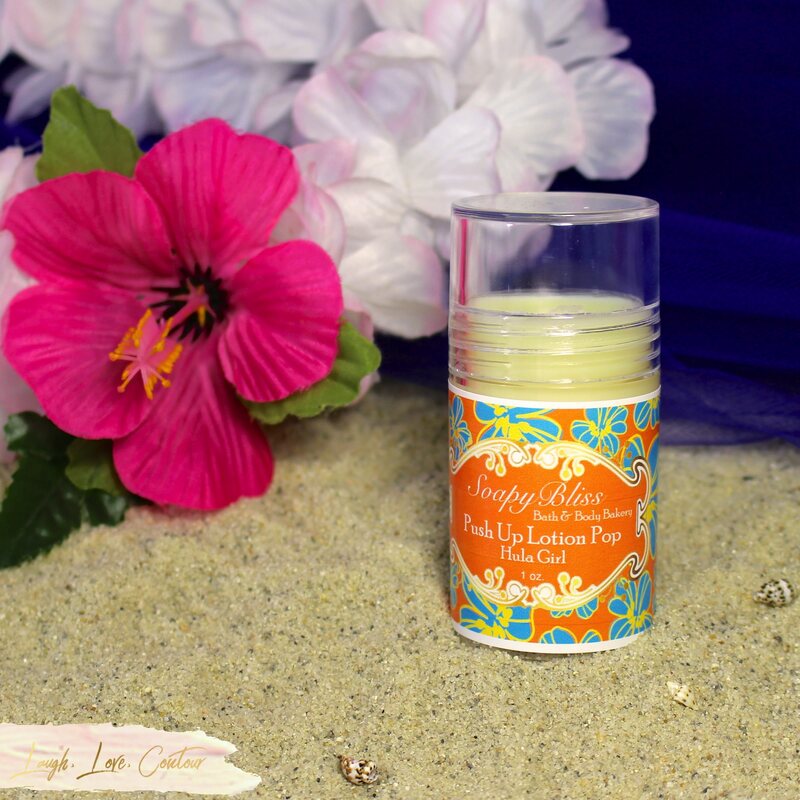 Have you tried the Push Up Lotion Pop or other products from SoapyBliss Bath & Body Bakery? What have you enjoyed? If not, what would you like to try? I'd love to hear from you! This sounds like a scent I would love! And I like the concept of a solid moisturizer! I've never tried a push-up lotion, or any solid lotion at all before! I'm super-intrigued, being a body moisturiser junkie. Sounds perfect for travel! And, the fragrance sounds lovely as well. This sounds wonderful, especially with winter coming up. This is a neat way to apply! Lemon Drop is what appeals to me most. I will need something like this since my skin is starting to feel the cooler weather. I'd love that scent. I like the idea of a lotion stick. None of those unexpected purse accidents! I've never heard of this brand or this concept! I like that it's lotion without being liquid for sure for all the reasons you listed! Obsessed with this packaging! It's so different! I am so in love with Soapybliss!!! Their products are amazing!!! I’m not a huge solid lotion person but this product is super adorable! I've never heard of this brand, but I like the idea of push up lotion! I've never been to Hawaii, although I'd love to go, this sounds like it would be perfect to hold me over. The having to wait for it absorb actually doesn't bother me as I do that already with my lotions.